You’re shaking like a leaf – the anticipation has officially peaked. The moment has come to witness your partner for the first time on your wedding day, standing up in their finest attire, grinning from ear to ear. What could be more dreamy and romantic? It would be bad luck to see your spouse before the ceremony, right? Debatable! Many people have embraced the “First Glance,” a new(ish) trend that flies in the face of tradition. 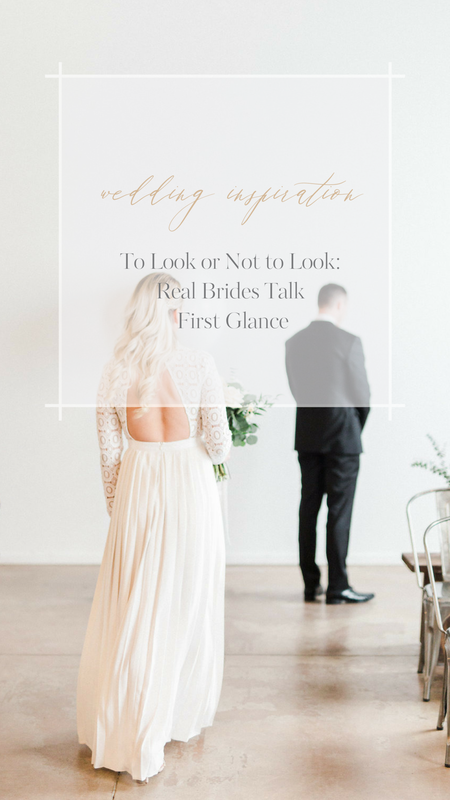 In the First Glance scenario, the couple reveal themselves to each other pre-ceremony, helping to shake off nerves and maximize time with their wedding party and guests for photos and the like. The long-cherished tradition of “hiding the bride” actually stems from the days of arranged marriages, when it was considered bad luck for the groom to see the bride beforehand as it might “taint her purity.” The bride was also forbidden to see herself – it was believed that if she saw her reflection she would leave some of herself behind in the mirror. It’s safe to say that the rigid margins of this tradition have relaxed, and that overall, couples are allowed to make their own rules. The First Glance can be wonderfully romantic, but saving the reveal for the altar is quite special too. Let us know your thoughts on first looks by commenting below or on our social media channels.